The MAD MEN of Climate-Change Alarmism | Watts Up With That? Readers may recall that I and some other climate skeptics were portrayed in a parody of AMC’s “MAD MEN” last week by activist artist Steve Brodner, who apparently can’t handle comments about his artwork on his blog, since he didn’t allow my comment asking for a full sized poster, nor comments from others that we know were submitted. Josh and I immediately started on a rebuttal parody, one that is also in a “smoke filled back room”, but the smoke isn’t tobacco smoke. We think our parody is also better researched than Mr. Brodner’s who seems to have only popular memes without references, and also failed to note that none of the people in that parody of his smoke cigarettes. Though, I do drink coffee. Be sure to leave a tip for Josh, as he worked over the weekend to finish this up. June 10, 2013 in Humor, Satire. Tags: Al Gore, AMC, Mad Men, RealClimate, Steve Brodner, Watts Up With That? ← More climate models FAIL – A chink in the armor at Science? I’m sure skeptics laugh more, while alarmists only laugh on their way to the bank. Brodner’s is an art piece that shows him in awe of those portrayed. Josh’s is parody with zero respect for the bunch of losers, even paternalistic wrt Mann, portrayed as a big brain-challenged boy. Expect them to get angry. Coffee mug of winners choice on Wednesday evening. That’s pretty funny that he didn’t allow your post asking for a poster. I would have thought that a narcissistic character would be flattered, but I guess the flatterer was not the right kind, eh? Yup, Climate Change is Settled Science, all right. But I doubt that it is in your face in the way that “Steve” intends. Don’t feel too bad about their not posting your comments, they would not post mine, nor does the Evolutionist Jerry Coyne …. something about how you cannot challenge his genius …. So I guess the motley CRU over at East Anglia didn’t make the cut. Or was that just an act of mercy? I have the original as a rotating desktop image on my Mac. I’ll have to include Josh’s excellent improvement in the rotation, as well. If you’re taking flak, you’re over the target. I didn’t expect the death throes of climate alarmism to come with New-Yorker-magazine-style cartoons, but it’s a sign of high-level defeat and desperation. Congrats, Anthony. James Taylor complained to me that they should have made his smoke a cigar to be accurate. Off topic question: can someone point me to an illustration of the role of water vapor in the IPCC’s models? I glanced at a graph, and didn’t understand where all the increased water vapor was going to come from. In Brodner’s parody, which seems to have it’s roots in Stalinist cartoon art of the 1940’s, there is a farcical attempt at a sublimal message tying in scepticism with tobacco use. Lewandowsky must have been consulted on the psychology of that. Any statistical information I’ve seen shows that Big Carbon subsidises Alarmist, “research” to a far greater extent than scepticism, but the lies about sceptic funding just keep coming. I’ll hit Josh’s tip box next, but can we have a full-size poster from Josh, please? When you look at and size up the Alarmist mad-hatters, it has to be said their main protagonists, wouldn’t discomfort much or anybody. In fact, it is a wonder that this bunch of chinless dorks managed to propel the scam [MM CO2 emissions=runaway warming] as far as it got. Indeed, it lends gravity to the received idea that and in the wrong hands – sow a seed and with a massive propaganda assault……can be powerful ‘medication’ for the masses – and that the herd mentality is still a default set deep in the human psyche. I think the motto – title for “Al and the boys” should simply read: “those damned liars”. Is the line ‘don’t smoke cigarettes’ a diplomatic reference to the occasional use of smoking materials other than cigarettes………………… such as cigars? Your forgot to put a tobacco shredder under Al Gores arm pit. Seems he has eliminated the page. My commentary was also “at moderation for ever”. A few day back I left comments on his page and they were still under moderation until yesterday evening. As plazaeme has noted he has eliminated the page from that specific url. He must have got a lot of blowback. 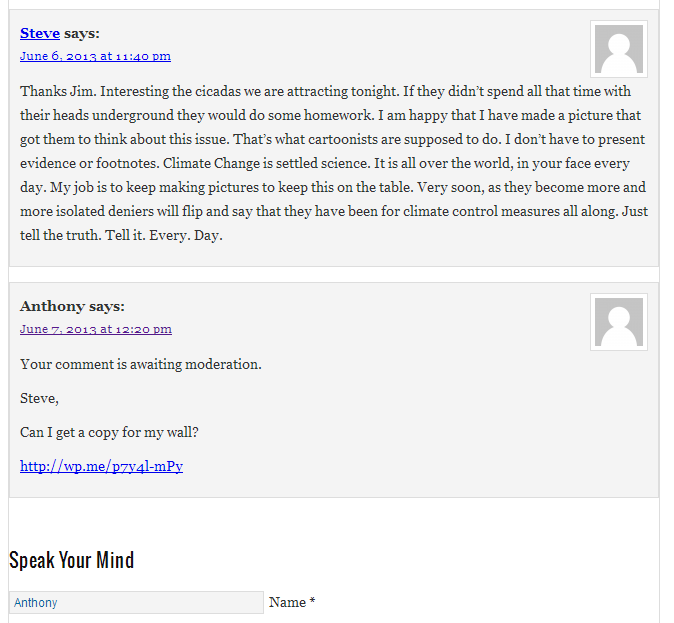 I sent him a tonne of quotes from climate scientists saying there was a temp standstill, contrary to his assertion. I also sent him Al Gore’s tobacco involvement. Here is the page’s Google cached version. One of his related pages is still up and you can post comments. I doubt he will publish them. Hahahahahahaha! It’s so funny cos it’s so true! Here is one of Steve’s comments. …Climate Change is settled science. It is all over the world, in your face every day. My job is to keep making pictures to keep this on the table. Very soon, as they become more and more isolated deniers will flip and say that they have been for climate control measures all along. Just tell the truth. Tell it. Every. Day…. In another comment he accuses us of having our heads in the sand. Mote, eye and all that. There may be a typo in the top left red square text. “has has”. error in the image text. Ha ha ha…would love to get that printed on canvas and hang it on one of my walls. Josh left out the Dr. Evil Pinkie-to-the mouth gag? No Mini-Mann? One thing I noticed with Brodner’s work was the fact that he has twelve portrayals of skeptics, which could be simply a coincidence, but I suspect it is a biblical reference. Given the quasi-religious nature of the Climatist cabal, perhaps that was a bit of psychological projection on his part. Far too kind to Lewandowsky, he looks a lot more like a slimeball on the video I saw than in the caricature. Just sayin’. There’s no reason to judge from appearances, he may be a really nice, decent guy in real life…. or maybe not, like I said, can’t judge from appearances. Better to judge people by their actions, errr … well, doesn’t get any better does it? Could it be Basil Fawlty? Faulty logic, faulty science, faulty conclusions, etc.? (Trenberth’s face is longer, like John Cleese, but he’s nowhere near as funny….). Anthony,you seem to have a burr under your saddle about smoking. Smoking is a reference to Mad Men (P.S. It’s not “MAD MEN”). It is, after all, a parody and reference to that TV series where nearly everyone smokes and drinks. I read that as “Al Cartoon Billionaire Gore” and was flashed back to Futurama, which while I disagree with his BS he spreads everywhere else, think is a fantastic role for him: comedy punchline. 30 Rock attests to this as well, but yeah, gotta love fretting over “multi-million dollar” schemes, while ignoring multi-billion dollar government investments in promoting lies. Something of an American-centric view of climate change in both Josh’s AND the original cartoon. Britain has been the world leader in climate change madness since the 1980’s, is actually signed up to Kyoto (which America isn’t) and has its own legally binding Climate change act-which America doesn’t. Phil Jones. Julia Slingo. George Monbiot/The Guardian. The entire British parliament who voted with 6 abstentions to the climate change act, with special reference to David (husky) Cameron and Tim Yeo. 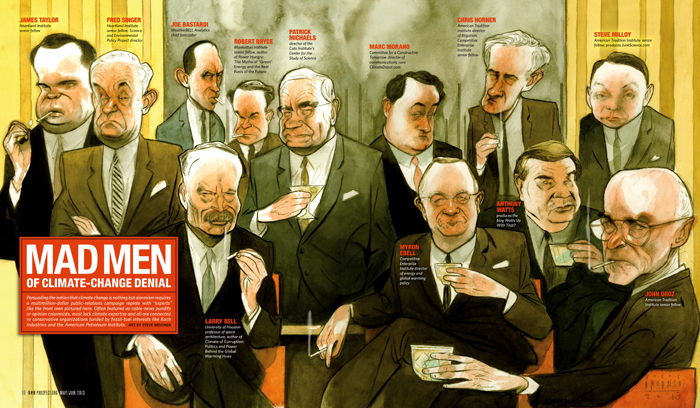 Brodner’s cartoon was done in hopes of getting it published at THE AMERICAN PROSPECT. The cartoon exists at Brodner’s blog and various skeptical site who ar having fun with it, I don’t see it at http://prospect.org/ yet. I like the thumbs and fingers. Ric. Many thanks. I will update my post, maybe Anthony can do the same here. “I glanced at a graph, and didn’t understand where all the increased water vapor was going to come from”. From the ocean I believe ….. This is actually the root of the entire climate debate. They are paternal twins separated at age 5 in a nasty divorce case. Kevin has always blamed the weather. They have been arguing ever since. Soon to be a Lifetime movie. Cook and sidekick Dana must be disappointed not to make it for their 97% work. My comment there was deleted too and even though it was a bit cheeky it was not baseless. John Droz a very civil and gentle counterpoint and that was deleted anyway. The man there is a closeminded bigot. However after a while mud-slinging gets old, and once steam has been blown off it is likely better to smooth the ruffled feathers and get back to the Truth. Get back to the scientific facts, the actual history of past weather events that were worse, and the mistakes in their arithmetic. Not only is it the civilized path to greater understanding, but you personally learn more and more about this wonderful world we live in. And here I thought it was a photograph–Oh, wait! It IS a cartoon with my reading glasses. …and so is their “climate science”. Well said tonyb!! They should all be shown up for the ignorant arrogant fools they are. Even the EU is slowly coming round to shale gas, the need for cheap energy to get economies moving again, to promote evil wicked “growth” & even more evil still, “wealth”!!!! Why do they only have three fingers on each hand? How come I never make the list? 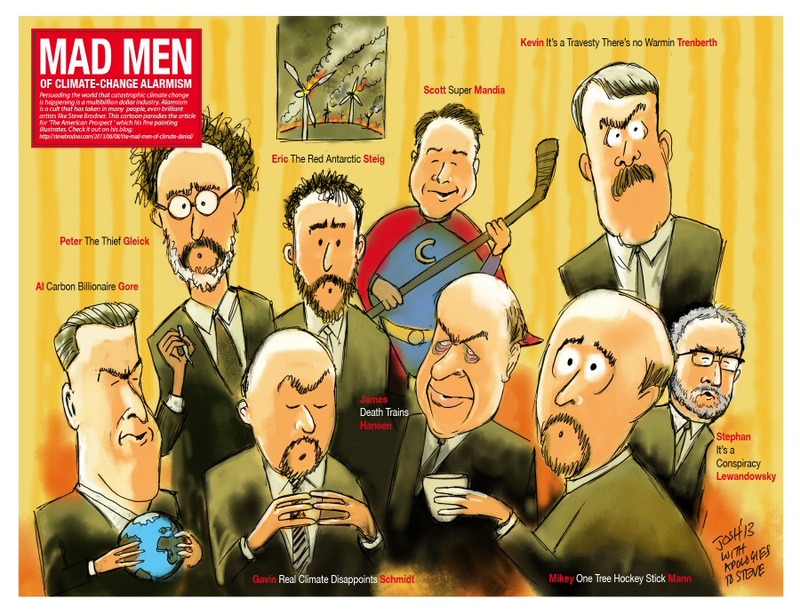 “Mad Men of Climate Change Alarmism” shows a group of men who actually are alarmists regarding climate change. Further, interesting is the lack of Mad Women in either portrayal. I guess the ladies just aren’t mad enough? I do congratulate Anthony Watts on being in the same room with that group of esteemed individuals. Nice. If you can make it there, you can make it anywhere. No wonder they are mad! The caption for Gore has the word “Blionaire”. Was this perhaps intended to be “billionaire”? Or possibly some form of “bloviate”. What? No mad women on either side? This is not politically correct, eh? John Cleese and Connie Boothe could never have written the farce that is the “climastrology” of Mann, Hansen et al…but it is rather funny that there are so many parallels…its too funny! My earlier comment regarding the lack of “Mad Women” is stuck in the mod queue. This comment is awaiting moderation at his site. I hope he thinks about it. Harpo is actually quite right. For years, I was very alarmed about climate change and concerned that we weren’t doing enough. It wasn’t until I was challenged by my father, a retired engineer, who had taken an interest in Steve McIntyre’s work and my inability to counter his arguments that I started taking a serious interest in the subject. Once I started to dig for myself and examine seriously the reasonable objections serious scientific skeptics were saying that I began to realize that the case for alarmism is extremely weak. 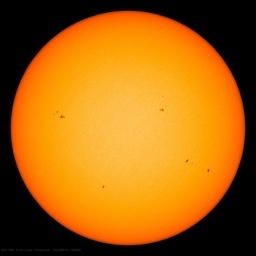 You mention that the ‘science is settled’. The science is NEVER settled – otherwise it would stop! Climate change has happened, is happening, and will always continue to happen – whether we influence it or not. Saying the ‘science is settled’ is shutting down reasonable and rational debate over an enormously complex subject, characterised by the depth of our ignorance, not our knowledge. If you don’t want to listen to those who you regard as ‘mad deniers’ – why don’t you at least listen to the balanced, reasonable, fully justified and supported views of tenured climate scientists such as Richard LIndzen, or Judith Curry or Roy Spencer or John Christy. These aren’t mad crackpots, but publishing and serious climate scientists who essentially caution against over-confidence, confirmation bias, and group-think that has blighted climate science for the past decade and a half. I urge you to at least examine what they say, and understand their objections before committing yourself to an opposing viewpoint without ever fully understanding what you are opposing. Seriously, can this be made available in a suitable size for print on a large scale? Of course I can just c&p…resolution would be limited! This is a subtle homage to 100-97 = 3. I.e. the real consensus figure. Or, as the spell – checker just suggested, the Con Census. I’m afraid Josh got it wrong on the “Most influential tree in the world” reference for Mann. That was Briffa’s claim to infamy with his Yamal reconstruction. There’s probably little doubt that Mann may have had a hand in it, but the reference is misplaced. I will say in jest that since the “mad men” were incorrectly portrayed smoking, perhaps Josh should have portrayed the other chaps toking on a bong. “Harpo” is currently being nice to him while sneaking a few suggestions in. Waiting to see if Harpo’s and my comments get deleted. If they are, then that will leave only Steve himself and one +1 type comment from 5 June. Or maybe he’s fallen off his bicycle and can’t do any editing ? How about a Wattsupwith Colander but you need to add a few more to get to 12. Is it ok to use the picture Josh drew up else where? No Phil Jones? Or Briffa? There is something missing from the Josh version…. I know! Front and center should be a big pile of IPCC, Tax, and Oil money. Instead of holding coffee cups, they are counting and pocketing the stuff. Speaking of stuff…. Al Gore is much too small. He’ll thank Josh. I will say, how could a caricaturist resist throwing in Lord Monkton?? Stephen Rasey – I was about to leave an almost identical comment. They could all be around a table full of money, with green shades on counting money with totals of grants (maybe with grants from oil companies listed separately) and/or energy business ventures listed above their heads. Gore would, of course, have huge piles already stacked behind him. Add 3 more guys and you can make a 2014 calendar…. Didn’t dinosaurs have three fingers? Off Toic, but wow. Anthony if you have not seen this yet, you should. Josh could add a potted plant named “Yamal Pine” and maybe draw Cook and Lewandowsky as conjoined twins. While the body of work Josh has created over the years speaks for itself, I think that in this case Go_Home has produced what is a most interesting version of this theme. I look forward o being able to purchase both. Well I’ve met Jo N. a few times and Donna F. once, and neither struck me as mad, but ‘committed’ would be accurate. Under the armchair quarterback, woulda, coulda shoulda file from a guy who couldn’t draw a straight line with a ruler, why isn’t the hockey stick shown as broken, or taped back together several times? As kadaka pointed out in the earlier thread, Brodner’s caricatures look more like famous people than the skeptics they’re intended to portray: “…Watts is Lech Walesa. Steve Milloy is Peter Lorre. And Joe Bastardi is Barrack Obama…” James Taylor and Fred Singer are Richard Nixon and Lyndon Johnson, respectively. For caricature, Brodner’s cartoon is largely a failure. And for a cartoonist, he has remarkably little sense of humor. 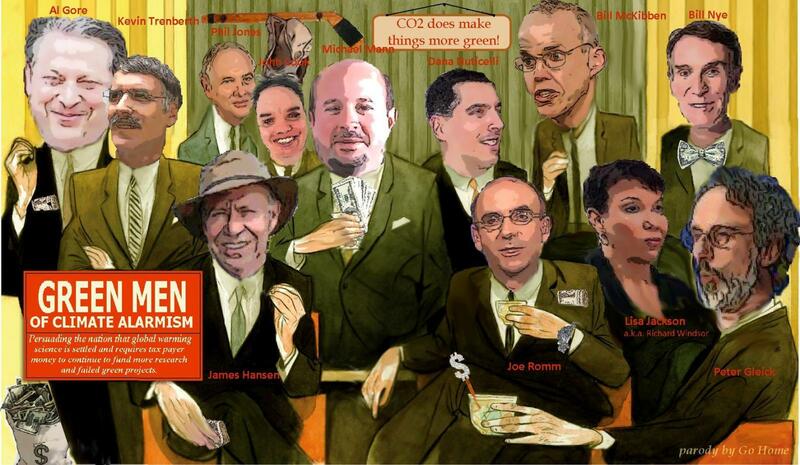 The uncentered principal components of climate alarmism aka mad men. Where’s Naomi Oreskes? She’s among the worst of the bunch! I don’t think those are meant to be coffee cups. PS The smoking thing. I smoke. The antismoking agenda in the US has gone way out of bounds. But I would never tell someone to start smoking. I would encourage anyone who does to quit. I know it’s tough. I had quit for two years 20+ years ago. Without getting into details, I had a tough day and asked a friend for a cigarrette. I thought one after two years would only be one. He gave it to me. Now I smoke again. If you smoke and someone you know is trying to quit or has quit asks you for one, tell them to ask again in 15 minutes. Give them a chance to get over a moment of weakness and/or stupidity. Quitting smoking is incredibly hard. But it is not so hard, if you understand the real reasons why you smoke. And they are not the reasons you think. This book has a more than 90% permanent success rate. It’s only a few dollars for a used copy. Is it worth it? You can be the judge of that. The madness goes beyond the warmists’ science. The United Nations Framework Convention on Climate Change ‘UNFCCC’ (UNFCCC consists of 154 nations including Iran, Saudi Arabia, China, Cuba, Sudan, Malaysia, Maldives, and so on) is the political body that writes the summary for each IPCC report. The purpose of each IPCC report (written by the nominated scientists by each UNFCCC member; are the nominated ‘scientists’ independent, opportunity for hidden agendas?) is to justify UNFCCC proposed world binding climate legislation. I.e The UNFCCC first determined a political agenda and then directed the IPCC to write reports to support that agenda. The current climate change proposal is there will be a carbon tax on all manufactured goods for all countries. A portion of the carbon tax will be sent to the UNFCCC who will administrate its distribution to developing and third world countries. The plan is the carbon tax will gradually be increased and by some miracle a new source of energy will be discovered and/or there will be massive job loss in Western countries which will result in either political reform and the abandonment of the climate change scam and/or riots. The UN bureaucrats, the developing countries, and third world country middle men and politicians all see the carbon tax money as a source of income and job security. The system is rigged to produce alarmist, fudged reports. The NGOs Greenpeace, World Wildlife federation play a central role in writing the IPCC report and then attend the yearly climate convention to give the impression that the citizens each country are aware of the legislation, want a massive loss of jobs, and support a reduction in living standards to solve a non problem. The estimated economic impact is also calculated by the IPCC. The NGOs are left of each countries’ green parties and are anti development, anti people. As the EU countries such as Germany have minority governments the green party is given the department of environment as a prerequisite to form a coalition and hence gets to select the scientists for the IPCC report writing. i.e. The process starts with a conclusion and then the job of the IPCC is to bend the data to support the agenda. The fact that there has been 16 years of no warming is therefore not a scientific issue for the IPCC. The issue is how to cover that fact up and then state all scientists speak with one voice: All Western countries must sign the proposed insane scam climate change agreement. As a kid I wanted to be an artist (commercial) and drew cartoons (among other things). From a Library book I learned (at that time) ALL cartoon characters had 3 fingers. After entering an art contest in the 6th grade, and comparing the winning entry with my own, I switched to math & science courses. I could pick all but 4 of them. Guess I’m a climatarian. This is brilliant, Steve, and I hope I will one day be able to tell my grandchildren about it. Joe Bastardi, Robert Bryce and James Taylor look truly evil in your painting. The others could have used more work to reveal their satanic nature but I understand the stress of modern production deadlines. Francisco Goya faced similar pressures in his lifetime but I think he had way more time to finish his 1821-23 Witches’ Sabbath. Off topic question: can someone point me to an illustration of the role of water vapor in the IPCC’s models?…. …Water is an extremely important and also complicated greenhouse gas. Without the role of water vapor as a greenhouse gas, the earth would be uninhabitable. Water is not a driver or forcing in anthropogenic warming, however. Rather it is a feedback, and a rather complicated one at that. The amount of water vapor in the air changes in response to forcings…. And that boys and girls is how you take a trace gas and make it the 21st century boogyman. DHMO, for sure – DiHydrogen Monoxide – a documented killer of humans. Oh, but wait, nobody cares about that, is it threateneing or destroying and wildlife? Whilst I know that correlation is not causation, there does seem to be a strong correlation between facial hair and climate alarmism. Maybe it’s one of the criteria for the peer review process for journal articles. Why is it then that in 2013 we have to convince some of our lawmakers to believe in science? Ninety-eight out of 100 climate scientists agree: Climate change is real, human activity is contributing to it, and it poses significant risks to our environment and our health. But apparently, that’s not enough for the climate deniers in Congress. Some have compared this so-called “warming period” to what they say are similar events during the Middle Ages. The truth is that the warming we’ve seen in the last 100 years is much worse — and much faster — than what we’ve seen in any time period before. If we want to get anywhere on combating climate change in Washington, we need to change the conversation — and it starts with calling out every single one of these climate deniers. Thanks for everything — and keep up the great work.